Pours very dark Brown / black with some nice lacing.Smells of malt and bread. Taste is bitter then Malt sweet. Very nice balance feels, refreshiing in your Mouth . I like this very much I give it a overall of 4.25 a great Stout a Flavorful beer. She pours a nice brown and leaves the same colored body very close to black, one finger tan head that dies within about thirty seconds, lacing is clingy and starts to spider web about a minute The smell has some dark malts, light cocoa and coffee-ish aromas play in the background. The taste has some bitter yet malty, and slightly salty, thick malty and cocoa-like aftertaste, dry finish. On the palate, she sits about a medium sort of body, only sessionable enough any English Stout can be - so not really, carbonation is fairly smooth and doesn’t pound me as some English Stouts have in the past, I like it for the most part. Overall, I haven’t had too many oyster stouts in my life time, and I say it again as I say for every oyster stout I’ve had, "where’s the oyster?" Maybe I just don’t get these things and am expecting too much as far as an oyster stout should go, I’ll keep trying them and still would have this one again. Packaged on 8/11/2016; poured from a 12oz can into a small nonic. Clear seal brown body with sinopia highlights and a smattering of active camel foam up top. Light surface slick and a lasting collar remain. Fine lacing, and below-average retention - surprising given the white wheat malt! Mellow roast malt aromatics with hints of chocolate and golden syrup in the nose. Faint sea-grass aroma at times, just at the edge of perception, probably coming from a combination of the briny oyster shells and the earthy Willamette hops. The malt bill delivers a complex flavor profile - tastes sprinting across the palate, running from caramel to unsweetened cocoa powder, with a hint of smoke (probably from the oyster shells rather than the Carafa malt) deep in the finish, rounded out by a final grainy sweetness from the oats. Medium-dry, though the alcohol is forward. Moderate bitterness, though the hop flavors are hard to parse beneath the wave of roast malt. Flavor seem to meld and improve a bit as the beer warms - the salt becomes more apparent as you reach the bottom of the glass as well. Silky yet medium-light bodied, with rapidly dissipating carbonation - alcohol heats you up more than I would like for the style. 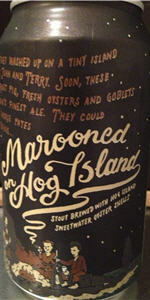 I enjoyed this more than my rating might indicate, though I find it lacking compared to the best oyster stouts I've sampled, which are generally dryer, less alcoholic, and more mineral-laden. Beautiful dark brown with auburn highlights, nice sweet chocolate and roasted malt nose, semi sweet roasted and bitter chocolate flavor, finishes more bitter and a little metallic than expected. Was hoping for some salinity due to its nature, but still a pretty good stout. Cheers!